(Lebanon, Penn.) November 6, 2014 – DRT Transportation of North Cornwall Township has been ranked as the fastest growing private company in Central Pennsylvania in the 2014 Inc. 5000 rankings. The annual Inc. magazine publication ranks the 5,000 fastest-growing private companies in the country based on three-year revenue growth. DRT Transportation was the highest ranked of the 17 mid-state companies in the list this year. The logistics and transportation company has grown exponentially since its founding in 2007. DRT Transportation had a 330 percent revenue growth between 2010 and 2013, posting revenue last year of $24.9 million. The company has added 16 jobs in the past three years and now employs 25. 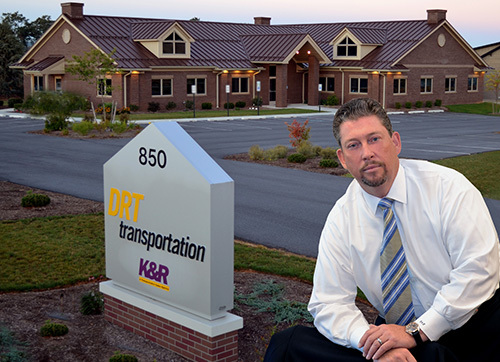 Rob Kemp, DRT President, poses in front of DRT Transportation’s headquarters in Lebanon, PA. Photo courtesy of Lebanon Daily News. DRT Transportation provides non asset based transportation services including full truckload (both dry van and temperature control), LTL, parcel, warehousing, supply chain optimization, vendor management and project management. In addition to the company headquarters in North Cornwall, DRT Transportation has branches in Tennessee, Texas and Minnesota to provide a comprehensive network across the country. DRT Transportation is recognized as a SmartWay™ Transport Partner by the Environmental Protection Agency and is a member of the Retail Industry Leaders Association, National Shippers Strategic Transportation Council and The National Industrial Transportation League.